Black Ice Software - Print PostScript documents to ANY printer from Linux, Unix, Solaris, SAP, Windows, with the BiLPDManager! 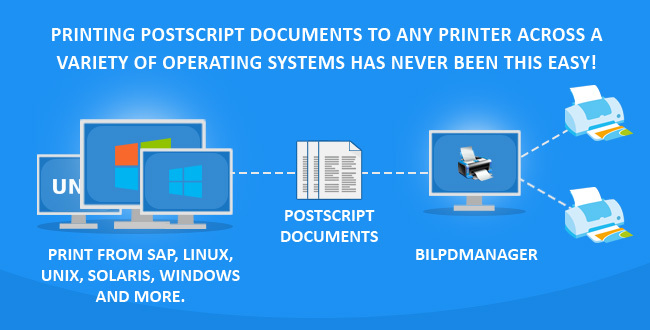 Print PostScript documents to ANY printer from Linux, Unix, Solaris, SAP, Windows, with the BiLPDManager! The BiLPDManager is the perfect solution to print PostScript documents from Linux, Unix, Solaris, SAP and Windows to an LPD Port allowing users to convert the document to PDF , TIFF, send the document directly to a physical printer or send the document directly via email! In the past, if one printed a PostScript document to BiLPDManager, at least one PostScript based printer must have been installed on the computer, otherwise the PostScript document was not interpreted and printed correctly. In the most recent version, the BiLPDManager can print the incoming PostScript documents to ANY printer, including the Black Ice Virtual Printer Drivers or Print2Email, allowing users to use dozens of advanced features, such as adding Watermarks, Annotations, Bates Numbering, or even sending the printed document in an email immediately! In order to be able to print/convert your PostScript documents from any operating system to one centralized location in the BiLPDManager, all you have to do is download the BiLPDManager - or if you are already using the BiLPDManager, upgrade to the latest version - configure the print queue according to our step-by-step instructions on the following link, and you are ready to go! The latest version of the BiLPDManager includes dozens of further improvements for printing to the BiLPDManager. The new version, BiLPDManager supports printing with multiple users simultaneously, and supports using separate queues for users. The new BiLPDManager also includes several stability improvements for registration, and for printing multiple jobs in quick succession.